Here’s a unique gift idea that’s sure to please any rancher, cowboy, traveler or anyone who helps when you need to circle the wagons…a Conestoga Wagon sculpture made from business cards! Maybe you know someone with a hankerin’ for the old west? Conestoga wagons were used in the United States and Canada mostly in the 1700s and 1800s. And here’s a bit of trivia; they generally did not have a seat for the driver. Drivers sat on a ‘lazy board,’ rode one of the horses or walked! These big wagons could carry as much as 6 tons of supplies. 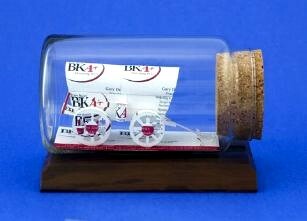 We have other old west gift ideas in one of our newest creations, the Stagecoach Sculpture under glass and made from 20 business cards. See also Horse, Oil Well, Mining Ore Wagon, Longhorn or even the Patriot Eagle sculptures.